In recent years there have been great efforts amongst researchers in improving the diagnosis of appendicitis in the ED. A range of clinical risk scores, biomarkers and imaging techniques have been tested to improve our ability to make the diagnosis1. This is great as we know that appendicitis is a serious disease. For the ruptured appendix, the septic patient and those with severe peritonism then surgery is the treatment of choice but like many conditions the diagnosis of appendicitis emcompasses a range of clinical severities. Indeed, our increasing ability to image the appendix using CT and ultrasound may well be leading us to diagnose the condition at ever earlier stages and thus lesser severities. This means that we amight need to change the way that we treat too. Whenever we see a step change in imaging or biomarkers we need to stop and think about whether we need to do what we always did. For example a recent post on chest drains challenged the dogma that all traumatic pneumothoraces need a chest drain. New technologies (in that case CT) mean that old treatments do not necessarilly apply to minimal pathologies. High sensitivity Troponin testing has confused some physicians for the same reason. Basically, as diagnostics change then it is likely that therapeutic options will change too. Back to the appendix and this week’s journal club. A recent paper in the Annals of Emergency Medicine2 on the use of antibiotics to treat low grade appendicitis in the out patient setting. Now the concept of treating appendicitis with antibiotics is not new and there are RCTs, non randomised trials3–13 and meta-analyses14–16 to support this approach, although antibiotic therapy is not without risks (e.g. recurrent appendicitis). There is little published evidence to date about whether antibiotic therapy can be safely achieved in the outpatient setting which would of course be relevant to emergency physicians. The abstract fornthis weeks paper is below, please have a read but of course we always recommend that you read the whole paper. It’s an open label randomised controlled trial. The RCT is clearly the best design here as the intervention is a therapeutic one. It’s open label as clearly you can’t placebo surgery! The study is described as a pilot study which should mean that it is exploratory and in many cases this means that we should be wary of drawing any firm conclusions from the results. Tell me about the patients. These were low risk patients over the age of 5 with CT/USS proven uncomplicated appendicitis. Patients were seen by the surgical service and deemed fit for randomisation. Patients with high risk features clinically (sepsis, diabetes, immunodeficiency, ACS, liver disease, pregnancy etc.) were excluded. In fact the list of exclusions is realy long (there are 23) but in all honesty they seem sensible and encompass a range of patients in whom you would probably not want to use out patient management of a potentially serious disease with. The trial had two arms. Patients either went for appendectomy with perioperative antibiotics or had a course of antibiotics with appendectomy if later deemed inevitable due to treatment failure. Patients in the antibiotic group were offered once daily IV antibiotics for 2 days and then a course of oral antibiotics for 8 days assuming that they were improving. Patients over the age of 13 could be discharged from the ED after 6 hours. Well, let’s be cautious here. There were only 30 patients in the trial. Although 48 of 120 patients were eligible 18 declined participation. In a pilot study17 that’s really important information as that declination rate might reflect a future RCT. It’s quite a high proportion of patients choosing to decline to take part. Feasibility18 is an important question in any pilot study and the reasons for decling to take part need to be understood. Having said that there really is very little feasibility outcome data or commen beyond demonstrating the possible here which is a little odd. The authors conclusions about multi-centre trials in the US are not really tested in this design. In terms of clinical outcomes then the main message appears to be that it is possible to treat some patients as out patients. In the antibiotic first group no patients required an appendectomy and so unsurprisingly they had better health outcomes in terms of time in hospital, pain, better quality of life scores and were able to resume normal activities faster than those who had an appendectomy. Two patients in the appendectomy group had complications and one in the antibiotic group had another episode of appendicitis also treated with antibiotics. However, the numbers are realy small and we must remember that this is a pilot study and we should not draw conclusions as a result. What else do we need to think about here? I’m puzzled about the treatment comparisons in this study. Is this a trial of appendectomy vs. antibiotics or a trial of out patient therapy? It’s unclear really as it’s a combination of the two. Arguably we don’t really need a trial of appendectomy vs. antibiotics as that’s already been shown to be effective. We might well need an outpatient vs inpatient trial with both arms of that trial getting antibiotics (and not surgery) but that’s not the case here. That begs the question as to whether this is a fair comparison. I would have preferred to see an RCT of in- vs. out- patient therapy rather than this trial. If we have already demonstrated that antibiotics are effective in this group of low risk patients how then is it ethical to offer appendectomy to half the patients? Surely any new therapy should be measured against the best current treatment? The patient population is quite unique in this study owing to it being single centre and there was only one child enrolled. What can we take away and put into practice. Not a lot, and that’s important. It’s seductive to transfer promising results from smal pilot studies into clinical practce but we should not. On this occasion we should note the interesting findings and look forward to a well conducted and adequately powered trial that compared out patient treatment against in patient treatment of uncomplicated appendicitis. 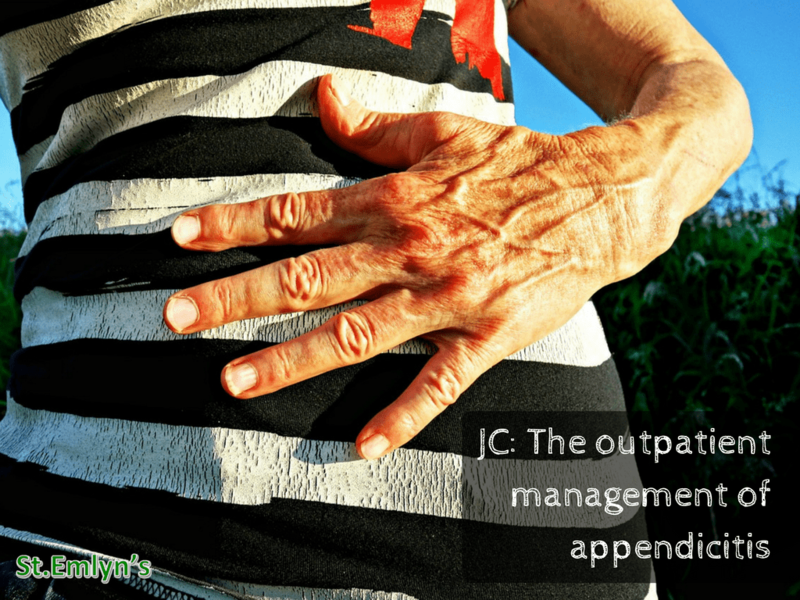 What is interesting to me is that outpatient management of appendicitis is already taking place in some places. In hospitals near Virchester the concept of a surgical hot clinic (essentially ambulatory care of adult surgical conditions such as low grade appendicitis, abscesses, biliary colic etc.) has been developed. In the UK these innovations have been borne from the need to reduce hospital admissions as a result of the combination of a declining bed base together with an ageing population. The resultant ED overcrowding is a real problem and any innovation leading to a reduction in the number of patients admitted to hospital is welcome, but we can and should only advocate it if there it’s safe for our patients. On this occasion it looks as though pragmatic clinical change is preceeding the evidential change. Ross Fisher raises some quite real concerns about this in the comment below (please read it). Do we really know the natural history of the disease without conducting well designed trials and might pragmatism without evidence put our patients at risk? I am happy to agree with the authors request for a larger multi-centre trial to get better data. They have specified that it must be a US trial. The reasons for the nationalist requirement for participation are somewhat unclear. We would be happy to consider evidence from a broad range of countriess and if you are already managing appendicitis as an out patient feel free to post a comment. Next: Next post: I think my child has a hernia: St.Emlyn’s. A few points for discussion. 2) early surgery prevents perforation. The extension of No1 is the fear that in waiting too long perforation will occur. Evidence for this is not strong. 3) Minimal inflammation must get better without therapy, as in all other parts of the body, thus “effective therapy” will include such groups. Thanks Ross. I think most EPs know this too and would share your concerns. I’ve added your thoughts to the main post. Many of us have seen patients one day with non specific and minimal signs only for them to return in a very poorly state within 48 hours. I think this paper is interesting as it is inconclusive (clearly) but we are aware of some surgeons doing this already. It’s always a concern when practice preceeds evidence and that’s why we think that a better trial is warranted if we want to pursue this. Rest assured that we will be referring all our patients with suspected appendicitis to our surgical colleagues.